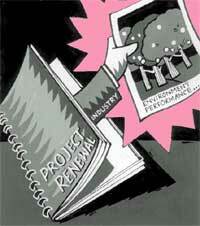 when it comes to disclosing environmental performances, Indian companies take a back seat. The Bhopal gas tragedy is an extreme example of a company being responsible for the death of thousands of innocent people. Had the company disclosed its environmental status beforehand, the crisis could have been averted. However, despite the catastrophe, there's a Bhopal waiting to happen in every corner of the country. When to make their performance public, companies usually go on the defensive. The first reaction one should expect: the information is confidential. And the alibi: regulatory authorities could crack down on us. A workshop, organised by the United States Agency for International Development's (usaid) Clean Technology Initiative (cti) and International Resource Group (irg), was conducted recently to find a way of encouraging disclosure of companies' performance on the environmental front. Various officials from industrial houses, government organisations, banks and financial institutions (fis) and non-governmental organisations (ngos) participated in the workshop. Delivering the keynote address, Malcom Baldwin, irg vice-president, said, "There has been an explosion worldwide in voluntary standards implementation." In India, about six years ago, Company Law made it imperative for a company's balance sheet to include two more statements -- one on energy conservation measures and another on the company's research and development efforts -- in addition to its financial audit. But a company reports the former as if it is an intrusion into privacy, pointed out an emminent industrialist. Companies usually perceive that what is good environmentally may not be good economically. The price of resources, like water and energy, are not taken into consideration while accounting for the environment. The obvious costs, according to most, are the cost of setting up and maintaining an effluent treatment plant (etp). Banks and fi s play a major role by making it mandatory for companies to disclose its performance while seeking loans. M N Dandekar, chief executive of Indian Banks' Association, called for a greater need for banks, especially those into development finance, to look into this issue. Many banks have incurred losses due to industries being shut down for environmental non-compliance. Russ Thirkell, consultant and Regional Programme Manager, United States-Asia Environmental Programme (us-aep), speaking on the role of fi s said, "There is magic about the positive improvements banks achieve when they integrate environmental issues along with the other issues in their evaluation process. Not only does a bank 'look good' to its clients and investors, it 'feels good' to know the bank is in control of its destiny. Is your banker prepared to meet the consequences when one of its client experiences an environmental crisis? Have you ever stopped to think, had the financial sector met its due responsibility alongside its client, the catastrophe might not have ever happened?" The workshop was conspicuous by the meagre representation from industry. Some delegates called for a legislation pushing companies to disclose their environmental performance, while consumer groups stressed the need for Right to Know Act. Interestingly, after the Bhopal gas tragedy, the us pursued what is commonly referred to as the Community's Right to Know Act, but nothing of that kind is available in India.